The month of January is not only host to several popular holidays including New Year’s Day and Martin Luther King Jr. Day, but also some lesser known national celebrations such as National Bath Safety Month. Celebrated annually, the goal of National Bath Safety month is to raise awareness of the potential dangers that could arise in the bathroom, and how to prevent bathroom injuries. Many studies have found that nearly 1/3 of falls that occur in the house take place in the bathroom. This makes bathroom not only the most frequented room in a house, but also the most dangerous. According to statistics released by the Center for Disease Control each year, more than 235,000 people visit the emergency room due to injuries suffered in the bathroom, and more than 2/3 of these injuries take place in the bath or shower. While studies and statistics both support the claim that the bathroom is the most dangerous room in a house, these types of accidents are oddly often overlooked as a cause for concern. Fortunately, with the right safety precautions many of these bathroom injuries can be prevented. Keep reading this week’s blog to learn fifteen ways to keep your elderly loved one safe in the bathroom. Install a non-slip strips or a mat in the bottom of your elderly loved one’s tub. Have reachable hand rails installed near the toilet, tub and sink. Keep the bathroom floor clean of laundry, towels and other clutter. Consider installing a toilet that is at the appropriate height for your loved one. A lot of falls happen getting on and off the toilet. You will also want to adjust the height of their sink and towel racks so they don’t have to reach or bend over too far. Move towel hooks closer to the shower to reduce water droplets on the floor. Many falls happen in the transition in and out of the shower or tub. Ideally, your loved one should have a walk-in tub or shower to reduce the risk of a fall. If you cannot afford one, you should look for a solution that has a low lip entrance. Consider placing a shower seat in the tub or shower. Dry up water as soon as it hits the floor. 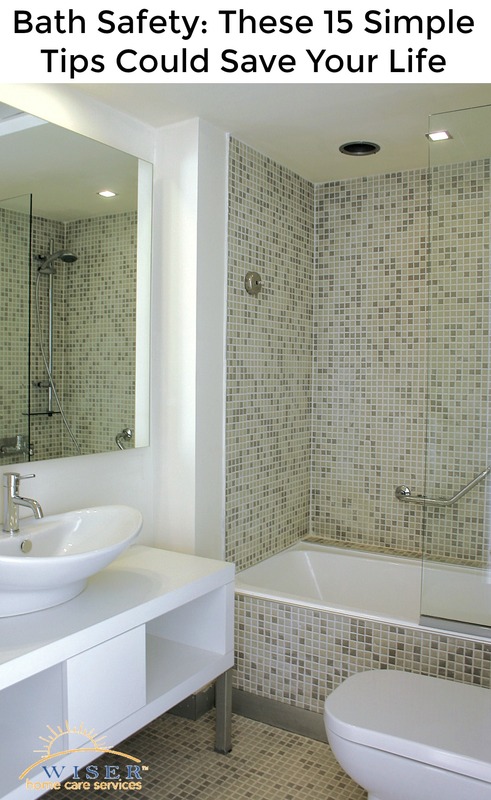 Consider installing a removable shower head that will allow your loved one to shower while seated. Keep the appropriate toiletries within reach of the sink, shower and toilet. Utilize a scald prevention device to keep the water at safe temperature levels. Use door locks that can be unlocked from both sides in case of an emergency. Finally, keep a portable phone in the bathroom. There are plenty of steps you can take to keep your elderly loved one safe in the bathroom. Through working together to raise awareness of bathroom safety, we can save the lives of hundreds of our loved ones. As always, if you care for an elderly loved one and would like help caring for or developing an extensive care plan, we can help. We will be happy to answer any questions you may have.